SAVE BIG on gift cards!! New Users: Right now, when you sign up for a new account with Raise.com you will instantly get a FREE $5 credit to your account. (that is FREE money, basically!) PLUS right now you can use coupon code FALL5 to get $5 off of a $50 purchase!! 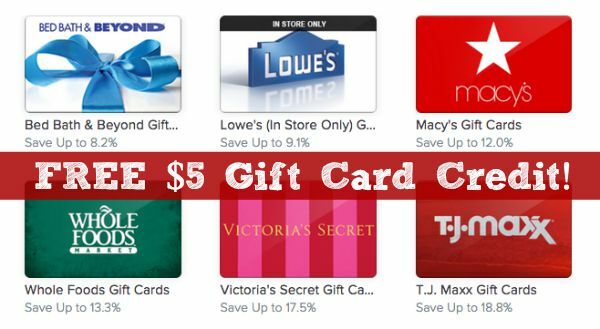 (new users only) Combine that with your free $5 sign up credit, and you will save $10 off of whatever gift cards you choose, as long as your checkout total is $50 or more! I have purchased cards on Raise, and I have also SOLD cards on Raise. Such an easy way to stretch your dollars EVEN more! RAISE75AF – $5 off $75 for new users. This code cannot be used with other promo codes. SPRING5 – $5 off $50 for new users. This code cannot be used with other promo codes. SPRING5: New users! $5 off your first order of $50 or more. This offer cannot be combined with other promo codes BUT you can stack it with your $5 sign up bonus! If you still aren’t using Raise, make sure to grab your free $5 credit now, and it will be there when you are ready to use it! Sign up for a new account with Raise.com you will instantly get a FREE $5 credit to your account. Also, if you are making a BIG purchase, the new Mother’s Day promo code gives you a chance to take 3% off the cards listed here on the Mother’s Day sale page when you use code: MOM3 at checkout. This discount cannot be combined with other coupon codes but CAN be combined with your $5 sign up bonus!